Why are circuses and fairs so fascinating? Why do people run away with the circus? And why do we love a circus fantasy story so much? I think it is because in olden times, the circus was almost the only travelling organisation you might hitch a ride with. There were others – army recruiters, roaming bandits, tax collectors – but the circus was the only one worth fantasising about. Nobody ever ran away with the taxmen. 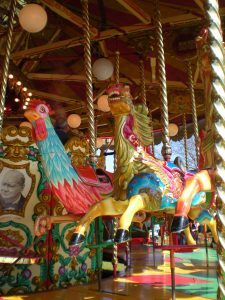 On this basis, then, let’s explore the elements you need to write a magical fantasy about a circus or travelling fair. Ringmaster. Must have a fabulous costume and extravagant manner. Female or male. Cape, tight trousers, top hat, whip, military coat optional. Common descriptors: fierce, magnificent, cunning. Giant strongman. Likely to be found in a strappy vest and tight breeches. Possibly Italian, almost always foreign of some kind (depending on where is ‘foreign’ to the story). He may be a gentle giant or he may be quick to anger. Common descriptors: mountainous, accented, moustachioed. Fortune teller. Many opportunities for prophesying and mystery here. The fortune teller, almost always female, sits in her small, round tent and dispenses sinister predictions which can come true in a good way, or, usually, in a very bad way. The fortune teller is often the only middle-aged female character in the entire story, so make the most of her. Common descriptors: headscarf, tasselled, talons. Bearded lady, mermaid in a tank, tattooed man, tiny person, etc. The acts are a source of comedy or pity, depending on the circumstances of their joining the circus. Perhaps they escaped poverty and humiliation and have made a fortune. Or perhaps they were hunted by pirates, trapped in a net and brought to the fair to sing for a living. They may be genuine magical /mythical creatures, or they may be total frauds who peel off a fat suit and an extra head every night. Common descriptors: pitiful, fascinating, defiant. The big top. Pic from wikipedia commons. Waif/Runaway/ other Outsider. This character sees the circus through fresh eyes and is handy for describing things all the other characters would be familiar with. Might be the protagonist. Common themes: befriending ill-treated animals, sleeping among the straw bales, and montage-learning many skills. Mirrors. The hall of mirrors that warps and distorts you – Neil Gaiman, many others – and offers entrance, willing or unwilling, to another world (Jonathan Strange and Mr Norrell.) From Sleeping Beauty to Alice Through the Looking Glass, mirrors compel the heroine or hero to look at what’s reflected, and they may not like what they see. A train. There is a deep cultural image of an enormous, cowcatcher-fronted steam locomotive chuffing across the landscape towing colourful cars. 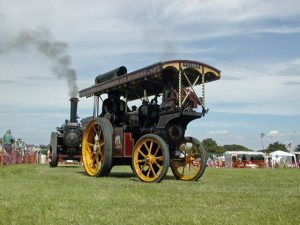 I found out that this even happened in Britain, which surprised me as I thought they moved exclusively by road – by wagon, steam-towed showman’s wagon (see the pic for glamping in one of these…) and in modern times, by truck. But no, British circuses moved by train too. There’s a circus train in Dumbo, and Ray Bradbury’s Something Wicked This Way Comes. Trains seem mysterious, arriving unannounced in the night, then stealing away after the show, clanging mournfully (another thing trains don’t do over here.) But in reality, it’s far easier for a road-based circus to arrive by stealth, since wagons don’t need, you know, rails. Common themes: steam, night, roaring/trumpeting from wheeled cages. Sand. A touch of the desert abounds inside the circus ring. They must have carried tons of sand around with them. Common themes: animal footprints, blood, the ringmaster cracking a long whip against the sand. Tent. A striped big top is a frequent image of a circus tent, or alternatively, a giant white series of swoop-crested tents. They’re all good, and of course, highly portable. The huge wooden pole propping the centre ridge must have seemed like a ship’s mast, and the canvas, the sails to another world. Sideshows might have their own tents too. The lack of solid walls makes them ideal for slipping in and out of unseen. Common themes: flaps, lightbulbs on guy ropes, flags. Magic. Every circus, every fair, holds the promise of Real Magic hidden in plain sight among the acts. This might appear as genuine levitation fuelling the conjurer’s act, steampunk mechanoids gaining a life of their own, true prophecy in a crystal ball, or an epic battle for good or evil played out across the Dust Bowl (Carnivale.) This is a chance to explore unusual magicks and crazy backstories. It can be as bizarre as you like, because if you can’t go wild in a circus, when can you? Country setting or city setting. The circus travels, by definition, so it can be in a windswept prairie, on a pier beside the seaside, or filling a town square. You can put your circus anywhere you like. I haven’t even mentioned Indian circus, clown college, Dagestan’s knife carrying tightrope school or any of the other circus-related settings you could choose. Put your circus in an imagined world. Put it in space. Other common items in circus fantasy: little drums for animals to stand on; runaways, often hidden in animal cages; trapeze artists and acrobats who perform tremendous feats of daring; night time; ropes and stakes – good for murder weapons and high-level chases; brightly-coloured lightbulbs and other newfangled technology, especially in sinister forms such as speak-your-fortune machines or mechanical dolls. Lightbulbs often explode at key moments, penny tarot machines tend to speak a portentous truth. Tassels and bunting, usually on tents but often on horses and in plumes on performers’ headdresses; and, although these form a subgenre all their own, clowns. I need say no more. Include some or all of these elements and you’re on your way to a circus fantasy story. 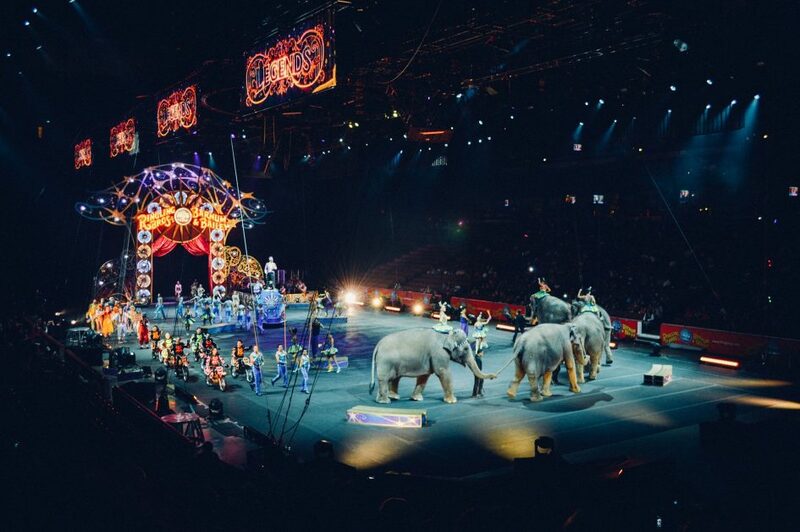 In a circus setting, things quickly become surreal and the impossible is everyday. With a literally movable feast and a cast of anything-goes characters, nothing constrains you. Whether you go medieval, Gothic, Victorian, 1920s, Depression, wartime, Sixties or contemporary, a circus fantasy is bound to please. The Singing Mermaid by Julia Donaldson. Watch out, it’s a tear-jerker of a bedtime read. The Night Circus. by Erin Morgenstern Fantastic gothic setting and memorable magic. Something Wicked This Way Comes, by Ray Bradbury. For me, the original circus fantasy. It’s Dark though, pun intended. 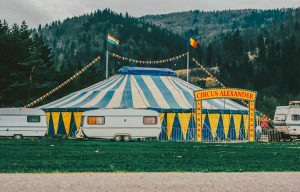 A Goodreads list of circus books. A TVTropes list of circus tropes in popular culture plus, related, details on The Circus Episode of many popular shows. Remember that X Files one? And here’s one of my own. Related: gypsy fiction, which I mention in this post about cards and spells. I’ve had a circus story on and off the back burner for a year or so. Mine is less magical and more practical but now I’m wondering if throwing some magic into the dust might spark it up some. Thanks for the reds too. I worked on a piece surrounding a state/county fair when I was in college. I’ll have to dust that off and re-visit it. I love reading about circuses, but I haven’t come up with anything in my head. Hi Laura, thanks for commenting! 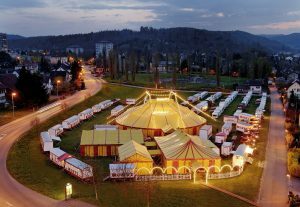 I think there’s magic in writing about fairs/circuses (also gypsies, theatre, and old style markets…) – whether you write ‘fantasy’ or not. If you do revive your piece I’d love to see it – it’d be great to share/link to some other writers’ stuff on my blog! Excellent! Noted, thanks Laura Beth.